The two populist parties that won the most votes in Italy’s March election – the Five Star Movement (Five Star) and the League (formerly known as the Northern League) – drew on different constituencies. While they had ironed out policy differences enough to make a coalition government feasible, concerns over their choice of a Euroskeptic finance minister have left things up in the air and may lead to new elections. Here are some key facts about how the two parties’ supporters stand out from the rest of the Italian public, based on a Pew Research Center survey conducted between October and December of last year. 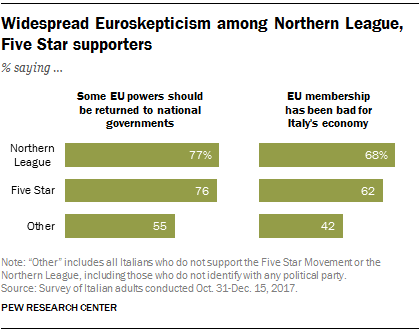 1 There is little overlap in public support for the Five Star Movement and the League. Only 13% of Italian adults had a favorable opinion of both the League and Five Star. In contrast, 46% of Italians did not have a favorable view of either party. The two parties also draw their base of support from different groups of people. For example, people who say they feel closest to the League tend to be less educated than Five Star supporters, and they are more likely to be female. Five Star support is also most prevalent in the south of the country, while the League is strongest in the north. 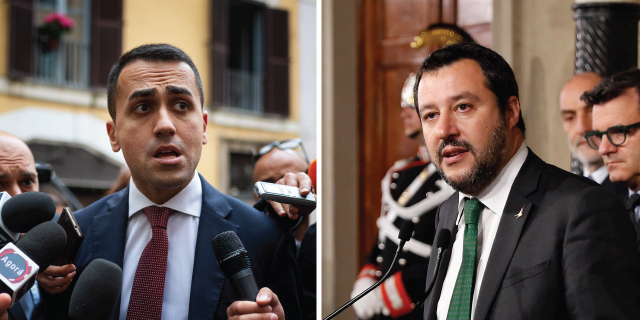 2Supporters of the two parties differ substantially in their views of immigrants and the benefits that they do – or do not – bring to Italian society. About three-quarters of Italians who identify with the League – which campaigned on a far-right platform focused on reducing immigration – say immigrants are a burden on the Italian economy because they take Italians’ jobs. About seven-in-ten League supporters also say immigrants increase the risk of terrorist attacks in Italy, including 59% who say they strongly believe immigrants increase the risk of such attacks. Those who identify with Five Star – which focused less on the immigration issue during the campaign – are more divided and much more in line with the views of the rest of Italian society. Among Five Star supporters, 49% say immigrants are an economic burden, compared with 40% who say they make the economy stronger. And while a majority of Five Star backers (55%) say immigrants increase the risk of terrorism in their country, a sizable percentage (42%) say immigrants do not increase terror risks. 3 Five Star and League supporters are more opposed to the European Union than the rest of the Italian public. Roughly three-in-four who support each of the two parties believe some EU powers should be returned to national governments. Further, majorities of both League and Five Star supporters say they feel this way strongly. Among the rest of the Italian public, a substantially smaller majority (55%) says some EU powers should be returned to national governments, and just 36% feel this way strongly. Majorities of League and Five Star supporters also say that EU membership has been bad for the Italian economy (68% and 62%, respectively). But the rest of the Italian public isn’t so sure: 42% say EU membership has been bad for Italy’s economy, while 50% say it has been good. 4 Both Five Star and League supporters think the government should provide Italians with a decent standard of living. The two parties campaigned on very different economic policies: Five Star proposed a citizens’ income to benefit the poor, while the League was more focused on lowering tax rates. The tentative agreement the parties came to when negotiating a coalition government included some elements of both proposals. While the parties’ most prominent economic policy goals may differ, majorities of both Five Star (82%) and League supporters (74%) agree that it is the government’s responsibility to ensure a decent standard of living for all. Moreover, about two-thirds of both parties’ supporters strongly feel the government should guarantee everyone a decent standard of living, which is substantially higher than the 51% who say this among the rest of the Italian public. Note: Full methodology and topline can be found here (PDF). Courtney Johnson is a research associate focusing on global attitudes at Pew Research Center. Kyle Taylor is a research analyst focusing on global attitudes at Pew Research Center.